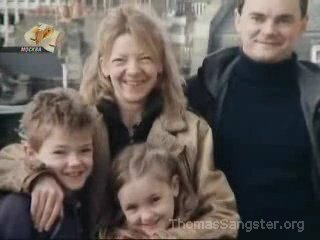 A couple of weeks ago an interview with Thomas Sangster from Russian TV made its way onto YouTube. It is one of the best interviews with Thomas I've seen but unfortunately all the audio is in Russian. Luckily, one of Thomas's very generous fans has translated the audio into English and sent us a copy. I've done a little bit of editing of the grammar and punctuation so it is a little easier to understand for English readers but it is basically as it was sent to us by bar_chonok / Vadim. Many thanks must go to him. Anyway, without further ado, here is the Thomas Sangster Russian TV Interview. To download the video to your computer choose which format you prefer and then right click the link and "save as" or "save target as". Remember that the audio is all in Russian. For those who do not wish to download the whole interview we have made a gallery with 40 snapshots from the video. You can view the gallery now or find a link to it from our online photo gallery section. This year’s British Teen Choice Award was given to – the red haired prodigy of British cinema – Thomas Sangster. Emma Thompson, Judi Dench and Rowan Atkinson all call him their favourite young actor. According to his extremely popular cousin, Hugh Grant, 'Thomas is truly a serious actor and a very precious relative' but Thomas is now more pre-occupied with his collection of model planes and getting his hands on a new petrol pump for his car. When he bought his banger of a car he became the coolest guy of the southern suburbs of London. Now lets hear the story of the 16 year old indigo kid with Olga Tekueva, Andrei Ulianov and Lubov' Kamyrina. My favourite subject at school is drawing. I also like to paint but I like to draw more. Sometimes you have to wait for hours on movie stage before they say 'Action!' and all this time I draw. I draw everything I see and everything I like. The sky, the plane, the boy. Light drafts made in confident strokes. He himself is only a draft yet: A draft of a self-confident man, a draft of a future Oscar or the Golden Globe winner probably and, no doubt, a draft of his own dream – a dream of a colour of indigo like the sky at dawn. There are such kids (his mother told him) – indigo children, a strange new generation that appeared at the turn of the millennium, the children that came from the skies, born by wise people, out of stereotypes. They know themselves, they know everything about themselves and can feel their destiny themselves. People often tell me I'm somewhat different, and my mom makes up some funny terms to describe me – she takes them from books and TV shows. She says I'm like not from this world. I don't know what world I came from but I know for sure what I want. I want adults to talk to me as an equal, I want them to consider my opinions. I want to work myself. My parents are both actors and I saw them act in some play on tour, I guess it was in Prague and I thought it would be fun to try. I was only seven then – just a little kid. I remember I asked a photographer we knew to make me a portfolio and then I sent the pictures to my parents' agent. And they asked me to shoot a movie. My Mum and Dad didn't know anything but they weren't surprised for some reason. They suggested that I enter a drama school but I still don't see any necessity to study acting. I got it all right away. I know what to do in front of the camera and I don't need any help. Of course, when your Mum and Dad are actors and your uncle is Hugh Grant, getting in a movie is a piece of cake: once you want it you're on screen. But that's the remark of uninformed sceptics. First of all, not once, twice or even three times this flamboyant boy has endured more than a dozen auditions before getting into the credits. Secondly, Hugh Grant is not exactly his uncle. I only met Hugh Grant for the first time in my life on the movie set of Love Actually. Well, we worked on different parts and at different times but we met at the parties and we drank coke together at the premiere. He is my relative but he's my – how do you put it – my grandma and his great-grandmother are sisters. We had never met before the shooting of Love Actually. We didn't even send Christmas cards to each other. I reckon if we had met more often I wouldn't have had as many problems during my first auditions. I tried to get the part of Harry Potter – but failed. But now I'm happy with it. Otherwise I'd get into the trap of this monotonous shooting. Besides, they shot 'Harry Potter' in studios mostly, and that's very boring. I prefer shootings on location, it looks more real. So if I had got that part I couldn’t do all the rest. The rest is history - a dozen movies and one more in production. Thomas drives his career deftly, much better than he drives his retro foreign car. His old Citroen moves awkwardly in the yard under the supervision of his Mum. 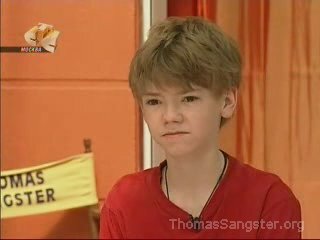 According to British laws Thomas can't be given his driver's license – he's still a little too young for that. He'll be able to get his full driver’s license in a year – at 17. British laws are more strict than American – I'd be able to drive in the city myself and I could go to film shoots without accompaniment over there. But for now I have to bring my mum to the set – that's the law. Actually the question is who looks after who – she's such a light-headed lady. And another strange thing, according to our laws 'Love Actually' cannot be seen by children under 14 and I was 13 at that time. They didn't even let me into the movie theatre at the premiere so I had to go up the red carpet and then go back. I was taken to a restaurant during the movie and after that we joined the premiere party and I even had a sip of Champagne. That was illegal of course but you won't tell anyone, right? Liam Neeson: Sammy! Fantastic show! Classic drumming, son. Thomas: Thanks. Plan didn't work, though. Liam Neeson: Tell her, then. Liam Neeson: Tell her that you love her. Thomas: No way. Anyway, they leave tonight. Liam Neeson: Even better. Sam, you've got nothing to lose and you'll always regret it if you don't. You've seen the films, kiddo. It ain't over till it's over. During the shooting I actually made friends with the girl that was my girlfriend in Love Actually but nothing more than that and I was terribly frightened of our on-screen kiss. When I read the script I thought 'Oh my god!' but when we began to shoot the part and they started doing the takes I got used to it a bit. It was just a kiss on the cheek and sometimes she didn't even touch me. So it wasn’t that difficult, it was a piece of cake, it was nothing, nothing to fear at all. And have you fallen for anyone in real life? Nah, I don't really fancy anyone, besides I don't have time for that. What do I want? I want to fly. My grandpa could fly. He was a pilot in the war and I remember the first time when I cried watching a movie was when I was watching Apocalypse Now. Actually I almost never cry when I watch movies. My mum cries all the time but I only did once. There is a part in Apocalypse Now when the helicopters fly towards the coast and the music is beautiful and it just takes your breath away and tears appeared in my eyes just like what happens in the strong wind. That's a very strong feeling. When I was 16 my mother gave me the best present, my most important present – a course at a flight training school. That's when you get into a tiny little plane and when it takes off the runway and lifts a bit in the air the pilot gives you the steering wheel and you can fly a little bit by yourself. British sky is low. It seems like it's just a stone's throw from here and you could fly without any special effects. The young star Thomas will take off and fly for sure, higher than the roofs, he knows that. The miracle is possible, it ain't over till it's over. I would like to keep on acting. I love that of course and I know my future will be connected with cinema. I think I can combine flying with it like John Travolta – he's got his own plane, he's a great pilot and a famous actor. And besides, when you do a movie you feel excited but at the same time you get butterflies in the bottom of the stomach, and you don't know what to expect – just like when you take off in a plane. When the filming is finished you have to go back to school. It’s good to see your classmates and to have a bit of rest and then set out again.